Chemo Ducks Now Hugging U.K. Children! 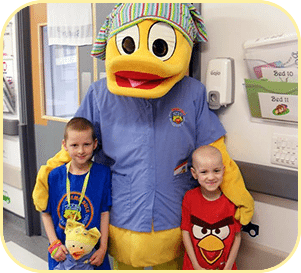 The first flocks of Chemo Ducks have landed in the arms of children in hospitals in the United Kingdom, thanks to a local shipping executive who has donated storage and shipping costs for the therapeutic toys. Thanks to Andrew Phillips of Jenkar Shipping Ltd., a freight forwarding company based in Yorkshire, England, “we now have our fulfillment in the U.K.,” says Gabe’s My Heart founder Lu Sipos. As a native of Manchester, Sipos always intended to bring the Chemo Duck program to children in her home country. “We recently secured the ability to export to England; in addition, the Chemo Ducks have been tested for and meet European Union standards, so we’ve been anticipating and working on this for six months,” says Sipos. The partnership is close to the heart for both Phillips, whose son is undergoing treatment for leukemia at Leeds General Infirmary in Leeds, England, and Sipos, whose mother received cancer treatment at the same facility. Leeds General is one of the biggest recipients of Chemo Ducks in the country.